Preface: A special Thank You goes to The Blackbeard Society for its generous financial support of the research I engaged in for this article. The Blackbeard Society is a new organization that strives to support of research, writing, and events created to enhance knowledge and appreciation of the notorious pirate’s history. More special Thanks goes to Colin Woodard, author of The Republic of Pirates (Amazon.com link here), and Jim Lawlor, author of The Harbour Island Story (Amazon.com link here), for their help during the research stage of this article. Some of their references led me to more obscure information about Thatch’s, Bonnet’s, Hornigold’s, and Napping’s careers. A further special thank you Bethany Easton of London who visited the National Archives at Kew and photographed some of the documents I needed for this study. Of all the pirates who sailed during the past millennium, Blackbeard’s history possesses more legends, myths, and unverified information than any other pirate. If half of the tales about his treasure proved true, his plunder’s value would rival those taken by pirates in the Red Sea in the 1690s and 1720s. Unfortunately, for treasure hunters, the historical record does not produce the same rich details featured in these many legends. After the defeat of Blackbeard, otherwise known as Edward Thatch, the navy did not find dozens of chests full of valuable coins like a creative writers might imagine. Instead, the navy men found barrels sugar, cocoa, cotton, and several slaves. When sold in Virginia, the perishable commodities sold for £2247.19.4 in Virginia currency. Some might propose that the navy and other people in the area missed or neglected to report Thatch’s other treasures. But, such ideas can only be conjecture since there is no evidence that Blackbeard collected an enormous fortune. The historical record often refuses to yield many of the claims made of Thatch’s story made by enthusiasts, writers, and even some historians. This difficulty of matching period evidence to these perceived narratives plagues Blackbeard’s early days as well as his later ones. In 2013, William Cronan in his presidential address to the annual meeting of the American Historical Association stated, “We [historians] are not allowed to argue or narrate beyond the limits of our evidence.” In the realm of Blackbeard’s history, publications from enthusiasts and historians alike stray far beyond what period documents say on a regular basis. Discussing the errors of every historian who published an account of Thatch’s career could fill its own book, but accomplish little towards bringing people closer to understanding what the historical record presents of Thatch’s history. The few known documents about Blackbeard’s early career lack information on many issues, including a definitive date for when Thatch became pirate, when he became the captain of his own crew, and what voyages he engaged in before his raid off the Virginia and Delaware Capes in the latter half of 1717. With period sources yielding few facts about this pirate, asking several questions of the historical record offers a means of understanding Thatch’s early days less hindered by centuries of old narratives and legend. What was the first document to record Edward Thatch’s activities as a pirate? When did Thatch first interact with Benjamin Hornigold? What was the first document to show he commanded a pirate crew? 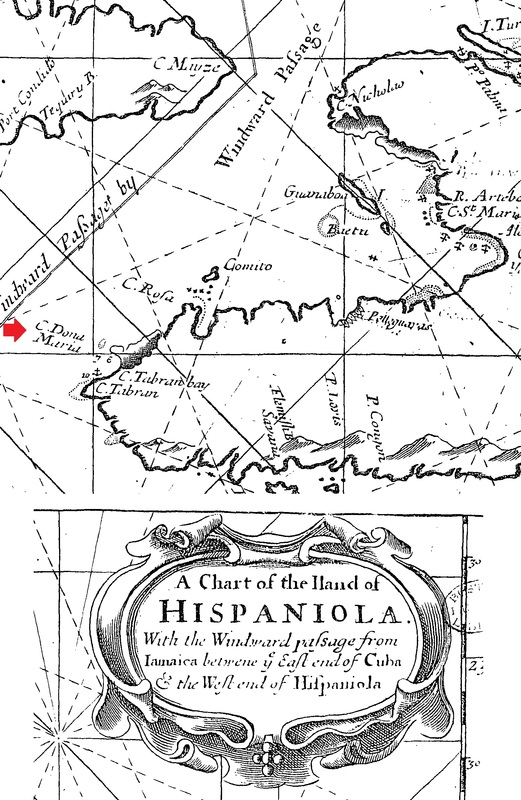 A map from 1698 showing the location of Cape Dona Maria, where Thatch and Hornigold encountered the brigantine Lamb (see red arrow on map). On December 17, 1716, the master of the brigantine Lamb, a vessel carrying a simple cargo of barrel staves and shingles, stood before Governor Peter Haywood of Jamaica and provided the earliest known account of Edward Thatch as a pirate. The brigantine’s master, Henry Timberlake, reported that he encounter two pirate vessels off western Hispaniola on the night of December 13. This document did not come to the attention of historians studying Blackbeard until recently. In 2010, historian Arne Bialuschewski published a reference to this document in his article concerning Thatch’s activities off Philadelphia in 1717 and 1718. Though the reference is brief, the deposition of Henry Timberlake stands as the first known reference to Edward Thatch as a pirate. In this account, Timberlake mentions Thatch as the captain of a pirate crew that participated in the looting of the Lamb alongside the crew of Benjamin Hornigold. The entire event began at 8’oclock in the evening when the pirate sloop Delight, under the command of Hornigold, sailed up to the Lamb, fired several warning shots, and ordered Timberlake to heave to in surrender. Timberlake obliged and followed Hornigold’s instructions to row over to the Delight with two of the Lamb’s crewmembers. While Timberlake stayed on the Delight, the pirates plundered Timberlake’s vessel. When he asked, “Why they used him,” the pirates responded, “They wanted provisions.” Timberlake reported in Jamaica the pirates plundered him of, “Three Barrills of Porke, one of Beef, two of pease, three of Mackrill[,] five Barrills of onions[,] Several Dozen Caggs of oysters, most of his [Timberlake’s] Cloaths[,] and all his Ships Stores Except about Forty Biskets and a very Small quantity of meat just to bring them in [to Jamaica].” The pirates also damaged or threw overboard £60 worth of barrel staves and shingles. After the pirates of the Delight spent an hour plundering the Lamb, Timberlake said, “Edward Thach[,] Comander of another Sloop, the name whereof this Deponent knows not[,] mounted with Eight Guns & manned with about ninety men[,] came along Side the Said Brigantine and lent their Canoa with Several hands on board her and plundered her.” Thatch’s first pirate action amounted to the simple lending of a few men and a boat to help Hornigold’s crew plundering of a vessel of some provisions. This event marks both Thatch’s first known action as a pirate and his first known pirate command. However, this document does not tell us the amount of time he spent as a pirate before receiving his captaincy. The beginnings of Blackbeard’s career remain a mystery. With so little information, it is difficult to make an educated guess for the time it took Thatch to become a pirate captain since many variables could play into a pirate becoming a captain. Until new documentation about Thatch appears, any claims made about his beginnings before December of 1716 can only come from conjecture, with few exceptions. The other earliest known report that mentions Blackbeard appeared a few months after Timberlake’s deposition in Jamaica. In March of 1717, a Captain Matthew Musson found himself cast away in the Bahamas. On July 5, Musson wrote a report on what he saw there to the Council of Trade and Plantations. Among many other details, he mentioned five pirate crews used New Providence as a base for their raids on merchant ships. Musson stated that Thatch commanded one of these vessels, a sloop of six guns with a crew of about seventy men. The report also mentioned Hornigold’s presence, who commanded a sloop of ten guns and about ninety men. The Musson account only provides a brief note on the presence of Thatch’s crew and little else. After this report, Blackbeard’s next documented activities came in September, leaving a six-month gap in Thatch’s history. Both accounts presents two pieces of information about Thatch, that he worked with the pirate Hornigold on at least one occasion and that he commanded a sloop with six to eight guns and a crew of between seventy and ninety men. These documents also demonstrate that Thatch was a typical pirate of that time, since many of the pirates of 1716 to 1717 sailed in sloops of similar strength. While the historical record provides only these two minor accounts for Thatch’s career for all events before September of 1717, there is one questionable account that caused many writers and historians to place Blackbeard alongside Benjamin Hornigold at many events, even though the historical record does not corroborate said claims. In 1724, a man under the pseudonym of Charles Johnson named Nathaniel Mist published the first two editions of A General History of the Robberies and Murders of the Most Notorious Pyrates. In the second edition, Mist claimed that Thatch began his career as a pirate captain in late 1716 when Hornigold turned the captaincy of one of his prizes over to Thatch. The two sailed together until the capture of the French frigate La Concorde, which Thatch renamed the Queen Anne’s Revenge when he made it into his flagship. After this capture, Hornigold allowed Thatch to keep the La Concorde, broke off his partnership with him, and left for the Bahamas. The use of this account by historians is often at the center of many problematic descriptions of Thatch’s early career. Mist’s account of any pirates during this period are highly questionable. Mist’s work is not a first-hand account of pirate history. His work relied on newspaper accounts, letters, and the testimony of a few witnesses he met in England. He also engaged in factual fiction, a common activity of authors at the time where the writer mixed fiction into the facts of an event for a host of reasons, including the establishment of a more entertaining narrative. Mist made several changes and additions to his text between the several printings of his work in the 1720s. In particular, several changes occurred to Thatch’s chapter between the first and second editions of A General History of the Pyrates. Mist made minor changes such as the spelling of Blackbeard’s name from Thatch to Teach and altered his birthplace from Jamaica to Bristol. A more noteworthy change is that the references to Hornigold and Thatch working together appeared in the book’s second edition. The first edition associated Thatch’s earlier days with Stede Bonnet and claimed Thatch was one of Bonnet’s foremastmen. Mist’s alteration of Blackbeard’s history appear to be attempts at correcting the early part of Thatch’s chapter. But, with its reputation for inaccuracies, especially for pirate who operated during the period of 1713 to 1717, it is inadvisable to only use Mist’s work for the history of Blackbeard or any other pirates and to check his accounts against other accounts of the events described. This lack of accuracy in the portrayal of Thatch’s early life in A General History of the Pyrates reveals itself when comparing specific events featured in Mist’s account to the historical record. The most plausible claim made by Mist about Blackbeard’s early days is that Thatch became a captain in late 1716, considering the evidence presented in Timberlake’s deposition. However, there is no document to verify that Hornigold gave Thatch his first command. Mist also claimed Thatch sailed in consort with Hornigold in the spring of 1717 out of the Bahamas for, “the Main of America,” and captured three prizes, a vessel under a man named Billop from Havana, a sloop from Bermuda under Mr. Thurbar, and a ship sailing from Madera to South Carolina. Based on the details provided, Mist appeared to gain his information from a newspaper account that came from New York on July 29, 1717 that reported on ships taken during June or July. The newspaper, besides reporting the events as occurring in the summer instead of spring, did not mention Hornigold sailing in consort with anyone. The New York account reported that Hornigold did take 120 barrels of flower from Billop’s sloop. Hornigold also took Thurbar’s vessel, but said vessel came from Jamaica instead of Bermuda and had a few gallons of rum stolen instead of wine. Finally, according to the newspaper, the pirate Paul Williams took the ship sailing from Madera to South Carolina and not Hornigold. After these captures, Mist’s account completely missed any of the other captures made by Blackbeard or Hornigold from late July to early November of 1717 and jumps to the capture the La Concorde. While evidence of Thatch’s consortship with Hornigold comes from only one early account, many other documents show that Hornigold sailed with several other pirates. Before working with Blackbeard, Hornigold sailed with Samuel Bellamy and the French pirate Labouse. In early April of 1716, Hornigold, in the sloop Benjamin of ten guns with a crew of about eighty men, captured a French sloop named the Marraine, also known as the Mary Anne. Immediately following this capture, Hornigold and his crew allowed a group of about twenty pirates in a type of boat called a periauger, headed by Samuel Bellamy and Paulsgrave Williams, to join their crew. Bellamy immediately gained the captaincy of the Marraine while Hornigold kept command of the Benjamin. The two sloops then encountered and convinced the French pirate Labouse to join them. Sometime before July, Hornigold disposed of the Benjamin, a former Spanish vessel, along with other illegal goods, to a John Perrin, who referred to the vessel as the Betty. At some point in the summer, there was a, “difference arising,” between Bellamy and Hornigold, “about takeing Prisoners; Some being for one Nation and some for another.” The pirates, possessing two sloops at the time, voted to split company, seventy-five remaining behind with Bellamy onboard the Marraine while twenty-five left with Hornigold on the other sloop. The accounts mentioning Hornigold’s career at that time do not provide an exact chronology of events, so it is unclear on what date this vote occurred, only that it happened sometime between late May and September. Hornigold recovered from the Bellamy incident during the fall of 1716 and gained command of the sloop Delight of eight or ten guns and a crew of around eighty or ninety men, which he commanded when working with Thatch during the plundering of the Lamb in December. While no known documents prove that Hornigold sailed in consort with Thatch in 1717, period sources do show that Hornigold did sail with a pirate named Napping much of that year. On April 1, Benjamin and Napping took the sloop Bennet, commanded by Captain Hickinbottem, off the coast of Puerto Bello. Hornigold swapped his sloop Adventure for the Bennet and then sailed back to Jamaica. On April 4, the two pirates took a sloop belonging to Captain James at Bluefields Bay, near the western end of Jamaica. One or more of the people captured at Bluefields Bay told the pirates there was a rich Dutch ship trading on the coast of Cuba to the north. Three days later, while still near Jamaica, the two pirates captured a vessel called the Revenge. Hornigold and Napping then proceeded to the southern coast of Cuba and discovered the previously mentioned rich Dutch ship sitting at anchor. The pirates attempted to attack the twenty-four-gun ship on April 12, but retreated after the forty-five-man Dutch crew repelled their assault. On the morning of April 14, Hornigold and Napping sailed away from its two-day standoff with the Dutch vessel just as the HMS Wincheslea appeared in pursuit of the two pirates. During these April raids, the two pirate crews took a total of 400,000 pesos and a chest of gold belonging to the Assiento Company from their captures of the Bennet and Revenge. By late 1717, Hornigold concluded his consortship with Napping. In June or July, the Boston News-Letter reported that Hornigold captured a sloop that recently left Havana and another from Jamaica, though the account does not mention Napping or the presence of a consort vessel. It is possible the two pirates briefly parted ways and continued in consortship later in July. Captain Candler of the HMS Wincheslea reported in July that the two pirates continued to sail around Cuba in sloops with crews of about a hundred men each. Three months later, their partnership ended. According to Governor Peter Heywood, Napping captured a small trader near Trinidad, a port in the center of Cuba’s southern coast, in early October. Napping told this trader that he had parted ways with Hornigold two or three days prior. Hornigold surrendered and received the Royal Pardon four months later in February of 1718, along with one hundred and fourteen other pirates and three of their captains. His name appeared fifth on the list of surrendered pirates made by Captain Pearse in June of 1718. Napping continued pirating without Hornigold, sailing to the waters between the African coast and Brazil by March of 1718. Governor Heywood’s account, besides showing that Hornigold and Napping working together, demonstrates that two other claims of Hornigold sailing with Thatch in late 1717 could not have occurred. In A General History of the Pyrates, Mist claims that Blackbeard and Hornigold still sailed together and careened their vessels on the coast of Virginia sometime between the spring of 1717 and the capture of the La Concorde. There is also one report in the Boston News-Letter that stated Thatch was in company with Hornigold when he captured a vessel sailing from the island of Saint Lucia to Philadelphia and another vessel from London sailing to Virginia, “in Lat. 36 and 45,” on October 18, 1717. Of the many accounts to report on Thatch’s cruise off the Capes of Virginia and Delaware around October of 1717, this one Boston News-Letter report is the only one to mention Hornigold. The entry came two weeks later than the other publications of Thatch’s activity. From the standpoint of the Boston News-Letter’s other reports and other sources accounts of these same events, the report is an anomaly. Considering the Peter Heywood account from October that placed Hornigold far away from Blackbeard during his October raids, and the number of other accounts that did not report Hornigold with Thatch and Bonnet, the best conclusion to make is that Hornigold did not sail with Thatch in late 1717. While evidence of the consortship of Hornigold and Thatch appears in only one account, two other pieces of evidences that concern both captains are not as easy to resolve. Both crews appear to have shared two notable crewmembers, William Howard and John Martin. Based on the testimony provided in the trial of John Howell, men named William Howard and John Martin both served as quartermasters in Hornigold’s crew. A man named William Howard also served as a quartermaster on Blackbeard’s crew, starting from when Thatch took over command of Stede Bonnet’s sloop Revenge in September of 1717. A pirate named John Martin also took the King’s pardon in the Bahamas in February of 1718. Not long after this surrender, a John Martin appears in Thatch’s crew when he sailed to North Carolina, though this Martin did not stay around for Blackbeard’s last battle. According to his survey of pirate numbers during this peak in pirate activity, Marcus Rediker concluded that around 4,000 pirates sailed the Atlantic between 1716 and 1726, and many crews demonstrated connections to one another through shared crewmembers or by sailing in consort with one another. Thanks to the Musson and Timberlake accounts, it is possible to show that Thatch and Hornigold worked together at least once, and sailed from the same harbor at the same time. With all this evidence taken together, it is not a radical conclusion to say that the two William Howards are the same person. This is also a possibility for the two John Martins. While the crew of Hornigold and Thatch appeared to have shared some common crewmembers, determining what insights this revelation says about the relationship between the two crews is difficult. When did Thatch first encounter Stede Bonnet? What was Thatch’s first recorded capture separate of Hornigold? When was Thatch’s first known battle? Stede Bonnet illustration from an unauthorized printing of Mist’s “General History of Pyracy” published by Edward Midwinter in 1725. Thatch did not appear more often in the historical record until later 1717, when he started associating with Stede Bonnet. In late August 1717, Major Stede Bonnet, a pirate captain who equipped and crewed a sloop for pirating out of his own funds from his plantation in Barbados in April of that year, sailed to the bar off Charleston, South Carolina. On August 26, in his the sloop Revenge of ten guns and about eighty men, Bonnet took two vessels, a brigantine under Captain Thomas Porter and a sloop under Captain Palmer. Bonnet let the brigantine go, but sailed Palmer’s sloop to North Carolina and used her to help careen the Revenge. According to one account in the Boston News-Letter, after careening in North Carolina, the Revenge encountered a Spanish warship, which Bonnet decided to engage. The battle resulted in thirty to forty casualties, including Bonnet himself. Afterwards, Bonnet decided to sail for the pirate base of New Providence. Considering when Bonnet captured Palmer’s sloop and the taking of the next vessel by the Revenge, this event occurred sometime in early September, if the report of this event is accurate. Not long after their arrival, Thatch appeared at the Revenge and offered the crew new direction in leadership. It was at New Providence that Bonnet met Thatch as a pirate for the first time according to known period accounts. If Bonnet and Thatch had any associations before this date, the historical record does not reveal any clues on where or when this occurred. No documents mention what Thatch said or did to convince Bonnet and the Revenge’s crew to take on Thatch as their new commander. Assuming that the encounter with the Spanish warship did occur as reported by the Boston News-Letter, the wounded state of their captain and his bad decision to engage the Spanish warship influenced the crew to elect Blackbeard as their new leader while Bonnet remained onboard without any duties. Another possible influence for this decision is that, around this time, Bonnet lost his confidence and began regretting his choice of becoming a pirate. According to the account of his trial, Bonnet, “At the time when Thatch having got the Command from him, he began to reflect upon his past Course of Life, and was filled then with such Horror, that he was perfectly confounded with Shame at the many detestable Crimes he had been guilty of.” Mist’s chapter on Stede Bonnet suggested that the crew saw him as lacking in maritime skills, disagreed with him over what the crew should do next, and that Blackbeard’s reputation as a pirate leader made him a more appealing captain than Bonnet. This claim, uncorroborated by any other account, may have been invented by Mist through logical guesses on what disputes a man like Bonnet might have had with his crew. Regardless of the reason, be it wounds, disagreements, or loss of conviction to continue his pirate career, Thatch replaced Bonnet as the leader of the Revenge, even though Bonnet remained onboard. Now under a new commander, the Revenge prepared for another cruise. When the Revenge sailed off the Capes of Virginia and Capes of Delaware, reports of the raids claimed the sloop, sailing without a consort, had 12 to 14 guns and 130 or 150 men onboard. It is possible that these reports exaggerated the size of his crew, especially considering the difficulties of containing such a large crew on one sloop. It is possible that the new men in the Revenge’s crew came from Thatch’s previous command, which numbered around seventy men about six months earlier, transferred from their previous vessel to the Revenge. If Thatch’s crew did transfer to this new vessel from the same vessel reported by Musson the previous March, the crew saw this as an upgrade to a larger and more powerful vessel. Others might have come from other pirate crews or from the community on New Providence. William Howard, who became Thatch’s quartermaster, joined the crew during the Revenge’s refitting. After repairs, the addition of at least two guns to the armament, and the replenishment of the crew’s size, the Revenge set out from New Providence and sailed towards Virginia to cruise for prizes. The Revenge under the command of Thatch encountered its first known prize at the end of September off the coast of Virginia. Not only is this encounter a first for the Revenge in that cruise, this is the first documented capture for Blackbeard separate of Hornigold as a consort and his first documented sea battle. On September 29, the Revenge, sailing near Cape Charles at the mouth of the Chesapeake Bay, encountered a sloop named the Betty. The trial of William Howard described the encounter as an attack. This could mean that the Betty continued to sail away when the pirates demanded them to stop and surrender, resulting in the pirates firing at the merchant vessel, instead of intentional near misses, until they surrendered. Another possibility is that the Betty did present armed resistance to the pirates and engaged them in battle. After Thatch and his crew took the Betty, the pirate plundered her of “Certain Pipes of Medera Wine and other Goods and Merchandizes,” and then sank and destroyed the vessel with what cargo the pirates left onboard. Thatch may have ordered the destruction of the Betty and its cargo in retribution for its crew’s resistance. Sinking the ship might also send a message to other vessels to the consequences of resisting pirates through combat. One other account also mentioned the taking of this sloop. In Jonathan Dickinson’s letter to Joshua Crosby on October 23, where he discussed the activities of Blackbeard off of Philadelphia that month, after mentioning his son leaving on a vessel that passed through the Delaware Capes on September 29, notes on that same day that Thatch, “tooke a Sloope to Southward of our Capes.” The Capes of Virginia, including Cape Charles, sit to the south of the Delaware Capes. After this first battle and capture, Thatch and the Revenge sailed north and took many vessels in and around the Delaware Bay in October. When was Thatch first called Blackbeard? What account first described his physical appearance? Edward Thatch illustration from the first edition of Nathaniel Mist’s “A General History of the Robberies and Murders of the Most Notorious Pyrates,” published in 1724. In the same letter that Johnathan Dickinson mentioned the taking of the Betty and other vessels around the Delaware Capes, he also provided the first known reference to Thatch’s famous name, Blackbeard. In one line at the beginning of his letter, Dickinson says the leader of the pirates raiding vessels off Philadelphia was, “One Capan Tatch All[ia]s Bla[ck]beard.” None of the other documents about these early raids mentions this alias. The source of Dickinson’s information is unknown. It would be another seven months before the writing of the next known document to reference the Blackbeard alias. As to why Thatch stood out for having a long beard, the early eighteenth century marked a time when it was unfashionable to wear beards. Shaven faces on men represented enlightenment, propriety, and Europeanism. Beards could represent or symbolize several things to Europeans of the time, including rugged masculinity, uncivility, and discordance with mainstream society. There is no way to know why Thatch grew out his beard, although the choice did help him stand out among his fellow pirates, which could be a potential reason as well. Since Thatch possessed the alias of Blackbeard by the time of his first cruise in the Revenge, it is likely that he began growing the beard long beforehand, though it is impossible to pinpoint the exact time Thatch decided to begin growing his notorious beard. While Dickinson mentioned Thatch’s alias, the first and only known physical description of Blackbeard by an eyewitness occurred six weeks after Dickinson’s letter. At daybreak on December 5, 1717, ten leagues (about 34 miles) west of Crab Island (also known as the Isla de Vieques, to the southeast of Puerto Rico), Henry Bostock, master of the sloop Margaret, encountered Thatch in his new flagship, the Queen Anne’s Revenge, along with Bonnet’s Revenge. Bostock surrendered to the pirates soon after they fired a warning shot with small arms. Bostock went onboard the Queen Anne’s Revenge and met Thatch, who he described as, “a tall Spare Man with a very black beard which he wore very long.” While Bostock described Thatch as a tall, lean man with a long, dark black beard, Bostock does not mention Thatch’s alias. This description pales in comparison to Mist’s lengthy, but unverified, description of the famous pirate. Mist described Blackbeard as having a, “large Quantity of Hair, which, like a frightful Meteor, covered his whole Face,…This Beard was black, which he suffered to grow of an extravagant Length; as to Breadth, it came up to his Eyes; he was accustomed to twist it with Ribbons, in small Tails, after the Manner of our Ramilies Wiggs, and turn them about his Ears.” Mist’s text continued with a description of his attire during battle, along with “two or three more of his Extravagancies, which we omitted in the Body of his History.” No other documents corroborate Mist’s claim that Thatch used ribbons in his beard, nor the stories following this description at the end of his chapter on Blackbeard that included some of the more enticing tales within the greater canon of Blackbeard legends. The only other aspect of Mist’s description that matches anything mentioned in any other accounts is the, “Sling over his Shoulders, with three Brace of Pistols, hanging in Holsters like Bandaliers.” During the raid off the Delaware Capes in October of 1717, one report in the Boston News-Letter mentions that, “They have Arms to fire five rounds before they load again.” This brief note refers to the crew in general and to the amount of arms the pirates possessed, since some pirates carried multiple firearms for fire superiority in combat. The report suggests many of the pirates in Thatch’s crew possessed enough muskets and pistols without having to reload immediately to continue firing. Beyond the possession of a long black beard and many firearms, it appears probable that Mist, wishing to entice his audience further, engaged in some factual fiction and decided to augment his work by tacking on his enticing description of Thatch and other stories at the end of Blackbeard’s chapter. The history of Edward Thatch in his early days is sparsely documented and often clouded by legends and Nathaniel Mist’s chapter about him in his notorious publication on pirates. But, when disentangled from myths and Mist’s unreliable account of the pirate, period documents reveal a few aspects of Blackbeard’s early career. While his birthplace and exact date of becoming pirate are still a mystery, he did gain the captaincy of a pirate sloop by the end of 1716. While he did work with Hornigold on at least one occasion, no other documents show any further operations conducted by Thatch and Hornigold beyond the capture of the brigantine Lamb. If Thatch did sail with Hornigold after December of 1716, the consortship ended by March of 1717 when he joined with Napping to raid vessels off of Puerto Bello, Jamaica, and Cuba. Blackbeard’s appearances in period accounts increased after he became the commander of Stede Bonnet’s sloop Revenge that he led into battle on September 29, 1717 for the first time off Cape Charles, Virginia, against the sloop Betty. Many more captures followed this engagement off the Capes of Delaware during the following month. By the time of this cruise in October 1717, Thatch had already grown his famous long beard and gained his alias of Blackbeard. While these bare details appear meager when compared to the narratives set down in publications written long after his death, this history of Edward Thatch does show what the historical record can reveal about the legendary pirate instead of repeating the folklore and one unverified account from a writer using a pseudonym. The history of Blackbeard and other pirates will remain tied to Mist’s work for the rest of time. However, after the efforts of many historians digging through period documents, it is now possible to start breaking away from the old narratives established by Mist and other legends, as this study demonstrates, and present pirate history without overdependence on these antiquated works and stories. While the historical record about Blackbeard’s early life currently reveals little information, this scarcity can change in the future. Archives, the front lines of historical research, can still contain documents previously unseen by other historians on pirate history. This includes the archives of Britain, America, France, Spain, and the Caribbean. Each individual historian who digs into these archives possesses only so much time and money to look for new documents. The next great discovery for the history of Blackbeard, or for pirate history in general, might come tomorrow or several years in the future. No one can predict when new documents might change our understanding of the past, but there is always a small chance that a researcher might announce the discovery of a new chapter in Blackbeard’s history by stumbling upon overlooked documents deep within the shelves of an archive. Postscript: Originally, this article was to be published seven weeks ago around the time of America’s Labor Day holiday, but I chose to delay it until I obtained some important documents that Mr. Woodard and Mr. Lawlor mentioned during my research phase. The inspiration for this article came from several sources. Blackbeard is one of the most popular topics in pirate history, further demonstrated by the increase in media portrayals and publications about the famous pirate in the past few years. For the history of this pirate, the earliest days of his career lacked the most, so I decided to address this dearth of coverage. While attention to the same pirates can become repetitive, I figured using Blackbeard’s early days to also examine the lives of other pirates, such as Hornigold and Napping, might help bring something new to the telling of Thatch’s history. The work of Kevin Duffus features many of these stories of Blackbeard’s treasure. Kevin Duffus, The Last Days of Black Beard the Pirate, 4th ed. (Raleigh, NC: Looking Glass Productions, 2014), 196-203, 206. Captain Ellis Brand to the Admiralty, February 6, 1718/19, ADM 1/1472, TNA; Captain Ellis Brand to the Admiralty, March 12, 1718/19, ADM 1/1472, TNA; Alexander Spotswood, “Letter from Alexander Spotswood to the Board of Trade of Great Britain, May 26, 1719,” in The Colonial Records of North Carolina, William Saunders ed. (Raleigh, NC: P. M. Hale, State Printer, 1886), 2:338. Sums of British currency listed in pounds, shillings, and pence will use the following format: £[Pounds Here]. [Shillings Here]. [Pence Here]. Deposition of Henry Timberlake, December 17, 1716, 1B/5/3/8, 426-427, Jamaica National Archives, Spanish Town, Jamaica. Arne Bialuschewski, “Blackbeard off Philadelphia: Documents Pertaining to the Campaign against the Pirates in 1717 and 1718,” Pennsylvania Magazine of History and Biography 134, no. 2 (April 2010): 166. I took notice of this reference around 2013. Soon afterwards, in 2014, I pointed out this article and its reference to a few historians and enthusiasts of Blackbeard’s history. After revealing the existence of the article and the Timberlake deposition, said people pursued the deposition and renewed their investigations into early Blackbeard history in mid-2015. The existence of this document is still a new revelation to the historical community that studies Thatch at the time of this articles’ publication online. Deposition of Henry Timberlake, December 17, 1716, 426-427. “Capt. Mathew Musson to the Council of Trade and Plantations, July 5, 1717, London,” Calendar of State Papers, Colonial Series, (from now on abbreviated CSPCS) Jan. 1716 – July 1717, item 635. “By Letters from South Carolina of the 22nd past,” Boston News-Letter, Oct. 28-Nov. 4; “Philadelphia, October 24,” Boston News-Letter, Nov. 4-11, 1717. In October of 1717, Jamaica Governor Peter Heywood stated that the pirates who sailed in the Bahamas and plagued Jamaica and other nearby colonies typically sailed, “never above two in Consort Sloops with about 80 to 100 Men and each 12 Guns.” Peter Heywood to Captain Thomas Jacobs, 14 Oct 1717, ADM 1/1982, TNA. For more on the authorship of this text, see Arne Bialuschewski, “Daniel Defoe, Nathaniel Mist, and the General History of the Pyrates,” The Papers of the Bibliographical Society of America 98, no. 1 (2004): 21–38. To save themselves typing out this work’s long title, many historians refer to this book by the shortened title of A General History of the Pyrates. Daniel Defoe [Nathaniel Mist], A General History of the Pyrates, ed. Manuel Schonhorn (Columbia, SC: University of South Carolina Press, 1972), 71. This particular edition, along with its paperback reissue many years later, is the best modern reprinting of this text, being the most complete reprint of Mist’s text, with notes to alterations made over editions and the potential origins of sources used by Mist to write these accounts. The editor, Manuel Schonhorn, also attributed this work to Daniel Defoe, a popularly believed fact for much of the twentieth century, since Schonhorn’s publication predates Bialuschewski’s research by thirty-two years. Charles Johnson, A General History of the Robberies and Murders of the Most Notorious Pyrates (London: Ch. Rivington and J. Stone, 1724), 62, 86. Mist’s text for pirates such as Thatch, Samuel Bellamy, Benjamin Hornigold, Thomas Cockram, Henry Jennings, and many other early pirates are sparse or outright missing in Johnson’s work. Significant pirates such as Jennings and Hornigold did not have their own chapters, while other lesser-known pirates obtained their own, short, chapters. One potential reason for lack of coverage for pirates in the period of 1713 to 1717 is the limited attention period print media in London paid to pirates at that time. Newspapers covered pirates much more during the period of 1718 to 1726. Mist often used newspaper accounts to help write his history, so the lack of coverage, or inaccurate coverage, of the history of Thatch and others in the early years is not surprising. If Mist did obtain other documents or eyewitnesses lost to us today, considering that he missed many of the events that occurred in the histories of Blackbeard and other pirates, then his sources lacked reliability and accuracy. Defoe [Mist], A General History of the Pyrates, 71. Both the Boston News-Letter and Weekly Journal: or Saturday’s Post printed this same report from New York on July 29, the former in the July 29-Aug. 5, 1717 issue, the latter in the Oct. 5, 1717 issue. The pirate Paul Williams likely refers to Palgrave Williams. The editor of the most accurate twentieth-century reprint of Mist’s General History, Manuel Schonhorn, also claimed in the notes to his edition that Mist used this account for his description of these events. Johnson [Mist], A General History of the Pyrates, 71. “Deposition of Robert Daniell, Depty. Governor of South Carolina July 14, 1716.” CSPCS, Jan. 1716 – July 1717, item 267; “Lt. Governor Spotswood to the Council of Trade and Plantations, July 3, 1716, Virginia,” CSPCS, Jan. 1716 – July 1717, item 240; Thomas Walker to the Council of Trade and Plantations, South Carolina. August 1716. CO 5/1265, no.52, TNA; Carl E. Swanson, “‘The Unspeakable Calamity This Poor Province Suffers from Pyrats’: South Carolina and the Golden Age of Piracy,” The Northern Mariner/Le Marin Du Nord 21, no. 2 (2011): 134-137; Deposition of Allen Bernard, Jamaica, August 10, 1716, Jamaica Council Minutes, ff. 63-68, Jamaica National Archives, Spanish Town, Jamaica; Deposition of Joseph Eels, Jamaica, Port Royal, Jamaica. December 3, 1716, CO 137/12, no.411i, TNA; Examination of Jeremiah Higgins, New York. June 22, 1717, Records of the Vice-Admiralty Court of the Province of New York, 1685-1838, 36-3; Examination of Richard Caverley, New York. June 15, 1717, Records of the Vice-Admiralty Court of the Province of New York, 1685-1838, 36-3; “The Trial of Eight Persons Indited for Piracy,” In British Piracy in the Golden Age: History and Interpretation, 1660-1730, ed. Joel Herman Baer, (London: Pickering & Chatto, 2007), 2:317-319. Deposition of Henry Timberlake, December 17, 1716, 426-427. It is unclear if the capture of surgeon John Howell by Hornigold to serve as a surgeon on his vessel occurred during the fall of 1716 or if it occurred after the capture of the Bennet on April 1, 1717. The testimonies of William Howard, one of Hornigold’s previous quartermasters, and of Richard Noland during Howells trial in December of 1721 do not offer a clear answer to this issue. Records of the Trial of Dr. William Howell, Minutes of the Council of the Bahama Islands, December 19-29, 1721. “Lt. Governor Bennet to Council of Trade & Plantations, Bermuda. July 30, 1717,” CSPCS, Jan. 1716 – July 1717, item 677; Records of the Trial of Dr. William Howell, Minutes of the Council of the Bahama Islands, December 19-29, 1721, CO 23/1, No 42 iii. Captain Candler to Josiah Burchet, 12 May, 1717, ADM 1/1597, TNA. “New York, July 29,” Boston News-Letter, July 29-Aug. 5. Captain Candler to Josiah Burchet, 19 July, 1717, ADM 1/1597, TNA. Peter Heywood to Captain Thomas Jacobs, 14 Oct 1717, ADM 1/1982, TNA. Letter of Captain Vincent Pearse, 4 March 1717[-18], ADM 1/2282, TNA; Letter of Captain Vincent Pearse, 3 June 1718, ADM 1/2282, TNA; A List of the Names of Such Pirates as Surrender’d themselves at Providence to Capt Vincent Pearse Commander of His Matey Ship Phenix, 3 June 1718, ADM 1/2282. Letter of Captain Vincent Pearse, 4 March 1717[-18]. “Philadelphia, Novemb. 14,” Boston News-Letter, Nov. 18-25, 1717. For more on Blackbeard’s cruise off the Delaware Capes in October of 1717, see Bialuschewski, “Blackbeard off Philadelphia,” 167-172. Records of the Trial of Dr. William Howell, Minutes of the Council of the Bahama Islands, December 19-29, 1721. Tyler’s Quarterly Historical and Genealogical Magazine, ed. Lyon G. Tyler (Richmond, VA: Whittet & Shepperson Printers, 1920), 36. This publication transcribed and reprinted the articles exhibited against William Howard in his trial. Letter of Captain Vincent Pearse, 3 June 1718,; A List of the Names of Such Pirates as Surrender’d themselves at Providence, 3 June 1718. Capt. Gordon & al £710 reward for taking Pyrates, September 19, 1722, T 52/53, TNA. Marcus Rediker, Villains of All Nations: Atlantic Pirates in the Golden Age (Boston, MA: Beacon Press, 2004), 29-30, 80-81. Captain Candler to Josiah Burchet, 19 July, 1717; “By Letters from South Carolina of the 22d past,” Boston News-Letter, Oct. 21-28, 1717; “The Tryal of Major Stede Bonnet, and Other Pirates,” in British Piracy in the Golden Age: History and Interpretation, 1660-1730, ed. Joel Baer (London: Pickering & Chatto, 2007), 2:327. The Revenge started in April of 1717 with, “126 men 6 Guns & Armes & Ammunition Enough,” according to Candler’s letter to Burchet written in July. “Philadelphia, October 24th,” Boston News-Letter, Nov. 4-11, 1717. The questioning of this engagement comes from examining the time line of events. This attack on the Spanish warship, so far, appears only in one document with no reference to a specific date. Meanwhile, the taking of the vessels off Charleston by Bonnet and the taking of the first prize by the Revenge under Thatch both have notes to a specific date and more than one document referencing their occurrences. For the Revenge to sail from Charleston on August 26 to North Carolina to careen, then sail to the place they engaged a Spanish warship, then sail back to New Providence in the Bahamas to refit the Revenge, and then sail to the Virginia Capes and take a vessel by September 29 is a lot for one sloop to accomplish. To engage in all this, in that short amount time, over that many miles of ocean, does throw some suspicion on the account of the Spanish warship encounter. “From New-York, Octob. 28,” Boston News-Letter, Oct. 28 – Nov. 4, 1717. “The Tryal of Major Stede Bonnet, and Other Pirates,” 367. Johnson [Mist], A General History of the Pyrates, 96. Johnson [Mist], A General History of the Pyrates, 95-96. In Mist’s version of this history, the cruise off the Virginia Capes, Delaware Capes, and off Rhode Island that Blackbeard conducted as captain of Bonnet’s Revenge occurred before taking two vessels off Charleston and without Blackbeard. Mist’s account also leaves out mentions of engaging the Spanish warship, Bonnet’s wounding, and places Bonnet’s joining with Thatch after the taking of the La Concorde. “From Philadelphia, October 24,” Boston News-Letter, Oct. 28 – Nov. 4, 1717; “Philadelphia, October 24th,” Boston News-Letter, Nov. 4-11, 1717; James Logan to Robert Hunter, Oct. 24, 1717, James Logan Papers, misc. vol. 2, p. 167, Historical Society of Pennsylvania; Jonathan Dickinson to Joshua Crosby, Oct. 23, 1717, LCP Jonathan Dickinson letterbook, 159, Historical Society of Pennsylvania; Ellis Brand to Lords of the Admiralty, December 4, 1717, ADM 1/1472, no. 11, TNA. Tyler’s Quarterly Historical and Genealogical Magazine, 36 (Trial of William Howard). Tyler’s Quarterly Historical and Genealogical Magazine, 37 (Trial of William Howard). Jonathan Dickinson to Joshua Crosby, Oct. 23, 1717, 159. Dickinson wrote another letter on November 14 that repeated the information about the Betty attack mentioned in his letter to Crosby. For more on Thatch’s raid on vessels of the Delaware Capes, see: Bialuschewski, “Blackbeard off Philadelphia,” 167-172. Jonathan Dickinson to Joshua Crosby, Oct. 23, 1717, 159. “Governor Johnson to the Council of Trade and Plantations, June 18, 1718, Charles Towne, South Carolina,” CSPCS, August 1717 – Dec. 1718, item 556. Alun Withey, “Shaving and Masculinity in Eighteenth-Century Britain,” Journal for Eighteenth-Century Studies 36, no. 2 (2013): 229-230. Deposition of Henry Bostock, 19 December 1717, CO 152/12/2 no 67iii, TNA. Johnson [Mist], A General History of the Pyrates, 84. “Philadelphia, October 24,” Boston News-Letter, Nov. 4-11, 1717. Benerson Little, The Sea Rover’s Practice: Pirate Tactics and Techniques, 1630-1730 (Dulles, VA: Potomac Books, 2005), 66, 135-136. As of the writing of this article, there are several historians and researchers still investigating Thatch’s place of origin, but none of these efforts has yet produced a decisive argument on where he came from, be it North Carolina, Jamaica, Bristol, Philadelphia, or London. There is the possibility that the documents that would prove where Thatch came from might be lost forever to the historical record. This entry was tagged Bahamas, Benjamin Hornigold, Blackbeard, Caribbean, Edward Thatch, Henry Jennings, History of Piracy, John Cockram, Napping, Nassau, Stede Bonnet. Bookmark the permalink.